NewsPlusNotes: Canada's Wonderland 2012: A Big Surprise? Next Week Is Announcement Week! We All Could Use A Splash Or Two, Right? Something New at Old Town! 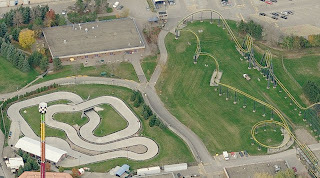 Canada's Wonderland 2012: A Big Surprise? Time to once again turn our attention to Canada's Wonderland, which appears to have started some serious work on a new coaster. Well, coaster is an assumption on my part - but few rides need as many rebar footer frames as are currently on site at the park! It's almost hard to believe that Behemoth, the park's last coaster, is already in its 4th operation season. It doesn't feel like it has been that long! Still, taking that into consideration it would seem that the park is due for another coaster - the park is, after all, the chain's most attended seasonal park. The area in front of the go-karts, especially, looks to be where footers are already being dug. Then there's a rather significant open area over to Dragon Fire. So what could the park be adding exactly? I have no idea! They've already got a hyper, family launched, inverted, flying, suspended, boomerang, stand-up, junior inverted, wild mouse and three wooden coasters, plus a few more! While their selection is varied, there's much larger launched rides on the market these days, along with vertical drops, floorless rides, wing rider style trains... still plenty to choose from. Check out CWMania for a huge selection of new photos of the work going on at the park. I can't wait to see how this one develops.